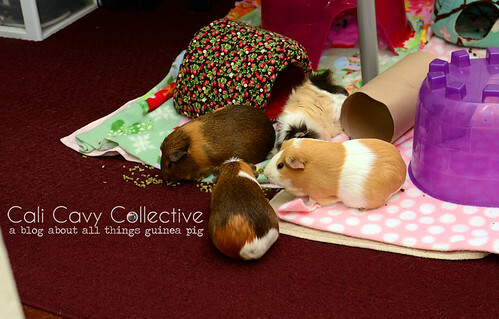 Floor time happens to be a prime opportunity to cause mischief... or so the pigs believe. Our usual routine is to change the cage while they stretch their legs and look for opportunities to cause piggy trouble. While they were gallivanting around, headbutting the blinds (Belka), squabbling over pigloos (Truffle), and beaning in unauthorized places (Peaches) I accidentally upended their pellet bowl. Upon returning with a dustpan I was greeted by the sight of four pigs huddled around the mess, gleefully crunching away. No use crying over spilled pellets when you can eat them instead!